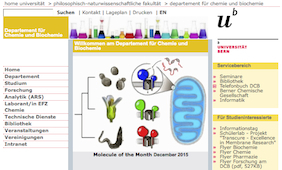 to the DCB Section of "Uni intern"
You will find further specific informations for employees of the Department of Chemistry and Biochemistry in the DCB section of "Uni intern". This section may only be accessed within the network of the University Bern. Access to the following linked pages is restricted to IP addresses of the University of Bern (130.92.*. *) or VPN connections provided by the University of Bern! "Früher war alles anders - und einiges war besser ..." The old DCB website will no longer be updated, however, and is only accessible within the network of the University Bern or with VPN!